My short summary of the whole birth experience is – Amazing, Wonderful….spiritual!! I DID IT!! All naturally with gas & air! I feel amazing!! I GOT MT VBAC!!…. Thanks Susannah for all your support throughout this pregnancy – especially when the ‘system’ seemed to fail me a bit!! Susannah’s ‘mummy centred’ and relaxed yet structured approach to pre-natal yoga helped me reach the places other classes haven’t quite reached… thank you Susannah! It has been good staying relaxed and active during pregnancy. The class has a calm atmosphere where I can talk about pregnancy and childbirth issues, and meet like-minded mums. Looking forward to Tuesday evening and a good sleep afterwards – about the only one I get a week! I love the way that you structure the classes which feel organised but totally relaxed at the same time, and the support you offer goes way beyond yoga. By my calculations he was actually a day early, by NHS calculations he was 6 days late. I still think I was right…. my contractions at this stage were very easy to cope with especially using the breathing. ….my contractions went from 6 to 2 minutes quite quickly. I decided to sit down and concentrate on nothing but breathing for 5-10 minutes, I relaxed myself as much as possible and did very concentrated breathing throughout the contractions and in between. Now I dont know if this was a fluke but I managed to slow the contractions down, my next contraction did not happen for 8 minutes which was a huge relief as I was starting to get a wee bit concerned we’d not make the hospital. I managed to restabilise my contractions back to every 3 minutes and regain absolute control. I jumped in the back of the car, on all fours!!! I personally found that not only did I need to breath through contractions but if I used the feather breathing inbetween I reduced the pain of each contraction before it arrived, it made a HUGE HUGE difference. I hope my labour story gives them assurance that the breathing works wonders. Thanks to you Susannah for all your patience and hardwork, much appreciated. I found my contractions bearable thanks to the breathing techniques you taught me. I found that the feather breathing worked best and I didn’t have any other form of pain relief. I would just like to thank you for all your helpful advice as I truly believe that it was yoga that helped keep me focused and get me through childbirth as I managed to stay relaxed throughout. Please say hello to all the girls for me and wish them all the best for their own experiences and to remember, above all else, keep breathing!! The yoga was of great benefit and i really enjoyed the classes as well as the couples course and would recommend yoga to pregnant women. Thanks for the classes and support through the chats after classes as well. The yoga awareness definitely helped with the early part of the labour so I could manage at home for longer. Hopefully ‘R’ and I can join you for mother & baby yoga once we’re past the six week mark. We applied some of your exercises and the most useful was the breathing! Just a wee note to let you know absence from class this evening is due to the inevitable. Following my week of walking in a tight (imaginary) skirt across the fields pelvic pain definitely eased (many thanks for this one) also a little one decided to make an appearance early Sunday morning. Have to support that of others advocating breathing as this definitely helped both in staying at home longer and during labour. Many thanks for your calming classes and wishing everyone else the best in forthcoming weeks. I have been really enjoying the classes and am disappointed I cannot attend as I feel they have benefitted me greatly, especially the breathing and relaxation. I really enjoyed your pregnancy yoga classes and hope to return to do some further yoga once I find the time and a routine. The breathing exercises and positions to help back came in handy (especially cos of the duration) and I used the TENS machine too. . until the syntocin took over, and then I found it all too quick to consciously use either! I thoroughly enjoyed your classes and hoping that the breathing will come in handy on the day. It was nice to just be at a class with other mums to be and share what we had been feeling as well as the exercise and the cake each week was also a nice touch. The classes were very informative about all aspects of childbirth and what to expect, different birthing positions and the breathing to undertake during labour. The class created an opportunity to relax and prepare in body and mind for childbirth. Practicising the labour breathing was very valuable, and learning how to relax which I was not previously very good at. I avoided the epidural and believe the yoga breathing contributed to be able to cope. The class was a perfect balance of time spent on poses and relaxation. I enjoyed the breathing exercises, the interaction with other mums to be and the cake at the end. After class I felt relaxed and virtuous that I had been doing exercise. I found the classes very informative, down to earth and friendly. I didn’t attend any other pre-natal classes so found that these classes provide me with enough information going forward with my pregnancy and labour. The classes actually changed my whole outlook to my birth, originally I was going with the flow/norm of having my baby in the local hospital but after hearing the story from one of the women about home birth I knew that this would be the option that I would want for me my partner and obviously my child. My job rather demanding and so I always looked forward to having some me time with the yoga classes, being able to relax completely and connect with my baby in ways that is not normally possible! I was felt refreshed and closer to my baby after the classes and made me think about my relationship with this little being inside of me. I would involve my partner by telling him all the things that had happened during the class! I really enjoyed the controlled breathing part of the class and obviously the cake!! 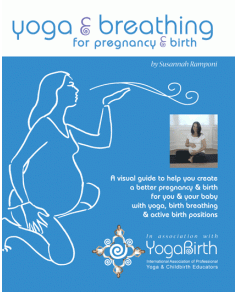 I used a lot of breathing during labour – I started off with candle breathing, I also used the ribbon breathing for focusing. For a while I went into a meditation zone – and during the transition it all went a bit out the window and I kind of lost it a bit. I was amazed how after it going to pot I went up a gear and became very focused. The Yoga exercise aspect of the class was the reason I joined, however in hindsight I would say that the discussions became the most important aspect of the class, as it was a great opportunity to hear how others were getting on, benefit from the wisdom of those further along the process and feel “normal” as I heard that others were experiencing similar things to me. I am still very much in touch with the friends that I made at pregnancy yoga class as it was a great environment for meeting like minded people who were going through pregnancy, childbirth and becoming a new mother at the same time as me. At the end of the class I felt so, so, so relaxed! I really enjoyed Susannahs serene smile and sense of humour, the inspirational quotes and most definitely the relaxation/meditation session at the end of the class. And who doesn’t love homemade cake??? I did appreciate that you were always able to give alternatives to cater for everyones different aches and pains! They said my breathing was great – I was “just doing it” automatically. I remember finding breathing through my hand to relax the pelvic floor very useful….. Also, the inhalation, followed by the broken up exhalation was good for me. And, as Susannah has said, keeping my face (and everything else) as relaxed as possible was helpful, and gave me something to focus on. Baby is charming us all and we’re enjoying him immensely! With best wishes when it is your turn. I absolutely love the class and its a highlight in my week… I have been doing some of the moves at home but doesnt quite have same effect as the class………and there is never a piece of cake at the end of it! [How happy are you with your birth experience?] ‘very very very happy… it was the best yet! I really enjoyed the experience, you are a great teacher and a great woman!!! I kept listening for your voice in my head telling me to do the slow breath. The best advice would be what you tell us each week – remember to relax and soften your face as you breathe through the contractions. And also, make sure if you’re having music to have some upbeat tunes on as well as any relaxing stuff. Like you said – you wouldn’t run a marathon listening to panpipes – you need something to keep you going! Thanks again for all the help and advice on the lead up, it really did help! I can’t thank you enough for all your help advice and support over the last few months, I’ve really enjoyed coming to class and have already recommended it to a pregnant friend! I didn’t really get any sleep but had an interesting night breathing through contractions – I found horse lips v good! !